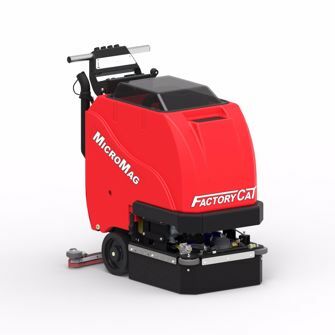 Factory Cat’s ultra compact MicroMag scrubbers are designed to clean machine shops, congested lunch rooms, car dealerships, and busy fabrication plants. They stand up to the demands of daily industrial use, including rough tractor trailer service bays. The disk models are available in 17ʺ and 20ʺ sizes, and our pad assist design offers unmatched propulsion. This adjustable pad bias is unique to Factory Cat and allows the machine to be almost completely self-propelled on most floor surfaces. The scrub head is protected by the frame’s heavy steel construction, with non-marking tires and bumper wheels to protect against marks. Like other Factory Cat equipment, the MicroMag is entirely MADE in the USA, and with American components that are assembled with stainless fasteners. The Factory Cat MicroMag is available in two options, Disk or Edge. Factory Cat Edge is a breakthrough in the chemical-free floor stripping process. With the unique Edge head it is capable of daily scrubbing with only 1/3rd of the water usage of old fashioned disk scrubbers. Its oscillating head doesn't fling dirty water like many traditional scrubbers, and can quickly prep floors for recoat.